Landscape Artist Nial Adams started painting in oils at the age of just ten years old. Studying under his father, Fred Adams, a highly accomplished artist trained in the ‘Old Masters’ style of Fine Art. Today Nial creates original oil paintings for you to enjoy and cherish. Nial Adams is a Norfolk Artist and Oil Painter, mostly of landscapes, in both realistic and impressionistic style. He practices the techniques of fine art, through studio work, bringing fresh ideas to traditional oil painting. From his Studio in Hevingham, Norfolk, Nial finds his inspiration in the beauty and drama of the natural world, and in particular in the landscape, coastline and skies of his home county. Working in oils on canvas, Nial’s artwork aims to capture the sensation of light, air and emotion of open spaces. Skies in particular are his focus. Whether it be of clouds floating through Summer skies, or the wild drama of wind and storms, he always finds captivating inspiration that needs sharing. Artworks vary in sizes with medium-sized canvases being his preference (e.g. 20” x 30”). He also has stock of smaller works (e.g 12” x 16”) and takes on commissions of all sizes. Mostly working on stretched canvas with traditional materials, Nial prefers the subtle tones and hues of, what could be described as, the Old Master palette. Nial’s favourite colours include – French Ultramarine (Blue), Van Dyke Brown, Yellow Ochre, the Umbers and Siennas, Venetian Red, Naples Yellow and the Cadmiums. Nial works from both personal references of his local landscape, as well as his visual memory and imagination. 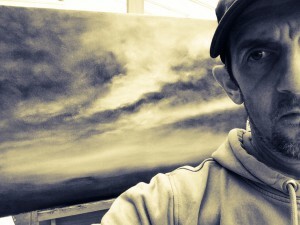 Big Norfolk Skies was established as the studio title for his work in 2014 and today he paints weekly, expanding his stock portfolio, as well as for private commission. Nial welcomes guest and visitors, by appointment, to his Studio in North Norfolk. He also provides art lessons and private tuition. My journey into art started in the very first years of my life. My father, Fred Adams, was an accomplished and extremely knowledgeable artist, art-teacher and art-restorer. 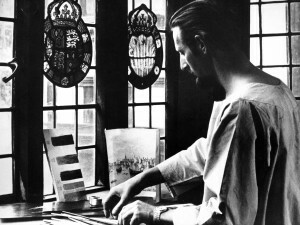 Living in Hampstead, London in the late 1950s and early 60s my father was very much the Bohemian Artist, enjoying a broad and diverse mix of creative culture. He worked for a time with C Roberson & Co, one of London’s oldest artists suppliers. it was here that he gained a wealth of knowledge in the techniques of the Old Masters. After leaving London for the country and moving to Norfolk he ran a small Artist Supplies and Framing shop in Elm Hill, Norwich, in the late 60s and early 70s. I was born in 1969. Before I could even speak I knew the smell of turps and oil paints. As a small child I’d watch my father work in oils, pastels, frame paintings and sketch beautifully. It was his drawing skills that first awoke my artistic interest. Watching him effortlessly glide a pencil over paper as he ‘felt out’ a line with such emotion and tenderness. Watching blank paper and graphite come alive, maybe a face, maybe a tree. I’d sit quietly and listen to him explain perspective and proportions. Like most small children my creativity mostly involved making things out of old cereal boxes and toilet rolls. Coloured pens and pencils, paper and glue was always the best gift. Imagination was the only fuel that I needed, no iPad, no Xbox. At the age of 10-years my father decided it was time for me to explore oil painting. He started, as with all his students, in monochrome and drummed home the essential skill of creating tonal value. Before ever approaching landscape painting I had to undertake the usual disciplines; painting spheres and other shapes in order to understand how light fell on an object and how shadows were cast. To learn brushwork and control. It was Christmas 1979, school holidays meant time with my dad and a chance to set up the easel and paint. Again working in monochrome and under his closer supervision he ‘allowed’ me to try my first landscape. This painting disappeared and only resurfaced after his death. I had no idea he had kept it. It is a treasure of limitless value, a moment captured in time. At 16 I studied Art at A-Level in sixth-form at the City of Norwich School, with no real plan to pursue art as a career. I simply liked and enjoyed it. Through my teenage years I would very occasionally paint in oils. The history of Art was also a big part of my education and parental guidance. My father’s knowledge of the Old Masters was unsurpassed; both in terms of his historical and biographical knowledge but deeper than this, he studied technique. Not just the application of paint but also the chemistry, or should that be alchemy, of the great oil painters. We would spend time in galleries, sometimes in my home city of Norwich, sometimes on a trip to London; the National Gallery, or the Tate. And this is where my love of the great artists deepened; Caravaggio, Velázquez, Monet, Joseph Wright of Derby, Millais, his personal favourite Rembrandt and many more. Above all of these though there was one that utterly captivated me; J. M. W. Turner. The energy, the rich but often dark colours, the light, all stirred my soul like nothing I’d ever experienced. I poured myself into Turner’s work and today it still has the very same effect upon me. I encourage everyone to visit a Turner exhibition at least once in their lifetime. Stand before the majestic drama of The Fighting Temeraire, with its golden radiance and be utterly consumed. Become intoxicated by the subtle hues of Norham Castle, Sunrise, or find yourself swept away in the turbulence of Rain, Steam and Speed. For me, there really is nothing that comes close to Turner’s work. With no plan to make art my career (I knew the story of the penniless artist all too well), I entered my early 20s through self-employment in the security industry. I travelled, eventually changed career, then settled down as a husband and father. For too many years I planned to paint more, to spend more time with my father at the easel. However, the practice of art was always something I would ‘get around to’, even though my passion for the subject never waned. There would always be next week, or next month. With knowledge, skills and my creative drive lying dormant for too long I was about to experience the biggest, most shocking catalyst of all. My father died suddenly after a number of years of poor health. No more chance to share ideas, ask questions or simply talk art. 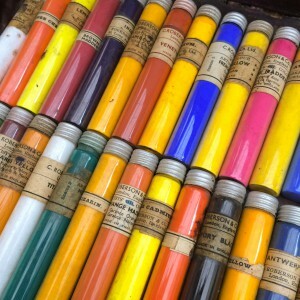 A collection of early pigments from C Roberson & Co.
Inheriting his wonderful old French easel, brushes and a collection of art ephemera brought back warm memories and at the same time a frustrating sense of ‘unfinished work’. Even today I still can’t explain what happened or why. I simply knew that I had to paint again. It was time to pick up the brushes. 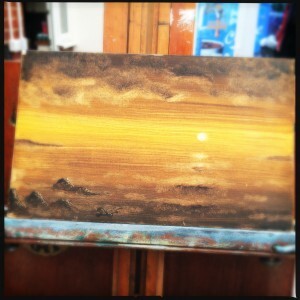 My tentative steps back into oil painting were crude, stumbling and nervous. I could ‘see’ but I couldn’t render those images and feelings. Then slowly, as I relaxed (surely always the secret) my brushwork opened up, my mind filled with images that I had to make tangible and my confidence grew. Sharing some of these first paintings with friends, mostly online, brought praise, encouragement and a large amount of obvious surprise. It is very fair to say that it is the kind words of many good people that have helped me to rediscover my artistic motivation. To those people, (and you know who you are!) I want to take this opportunity now to say thank you for all your encouragement and support. I really could not have done it without you. Today, time spent at the easel is something I love and cherish. It is time that I spend with my father; quietly, consciously, and with deep respect and appreciation. I feel the unbreakable connection to him. Early on, when I returned to my art, I would reach a point in a painting where I struggle and falter. I wished that if only I could ask my father’s advice. I’d step away from the canvas and think; what advice would he give me now? So I would ask him. There was always an answer and slowly I began to realise that all those years, over four decades, his knowledge and wisdom of painting had surely and slowly seeped into me. Today I paint because I can and because I need to. It is beyond doubt the most powerful form of self-expression for me. I love the process; I love the challenge of taking ideas and images and creating illusions. I even like the sense of nervous expectation before I start painting. It starts long before oil touches canvas. Working out how the layers will be added, how tones will transition, the colours compliment and contrast, how the final highlights with breathe life into a piece. All this requires deep thinking and attention, often for many days before I start to paint. Then at other times I simply ‘free paint’, as I call it. I start with a blank canvas, no sketches nor references, and often no clear ideas. Then begin to paint with only feelings. Slowly as the painting takes shape the focus begins and I aim to pull the painting from the canvas, in much the same way a sculptor cuts away the waste stone to reveal the creation. However I paint, the end result is never certain and often there is some deviation along the way. There are no bad brushstrokes and often ‘happy little accidents’. The end result is, as they say, what it is. It comes from within and I hope it connects us. If you have a specific requirement, perhaps for a gift or commission, please contact me personally, without any obligation. I’d be delighted to talk with you.